BDNF is the Most Powerful Compound in Your Body That You Haven't Heard of. BDNF has been called 'miracle-gro for the brain' due to its ability to grow and repair neurons on the body. BDNF, the neuro-protein boosted by Neuro Coffee, is an essential component for processed in your brain responsible for learning and memory. Research shows that BDNF helps promote growth and replication of feel good neurons, which produce serotonin - one of your body's Happiness Hormones. BDNF also plays a role in how your brain regulates your blood sugar and the number of calories your eat and burn. 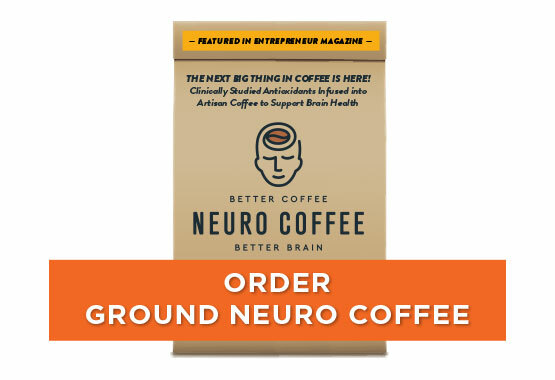 Neuro Coffee is a Premium BDNF Boosting Brain Supplement Infused into Artisan Roasted Coffee. Taking Care of Your Brain Health has Never Been So Easy! 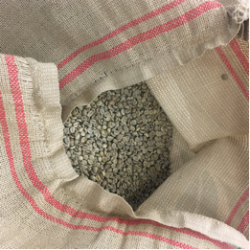 Neuro Coffee contains premium coffee beans that are hand picked from a selected group of craft coffee growers from across the world. Every batch of Neuro Coffee is hand roasted to perfection in rural Texas by our family run coffee roasting partner. Neuro Coffee is enhanced with patented antioxidants from the coffee fruit. 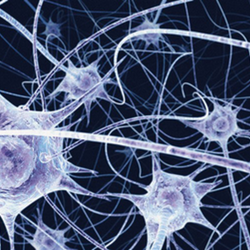 Giving Neuro Coffee the neuron growth and repair support that puts it in a league of its own. Every bag of Neuro Coffee is designed to contain clinically studied dosing of patented coffee fruit antioxidants to support your body's natural ability to grow and repair neurons. Neuro Coffee contains premium coffee beans that are hand picked from a selected group of craft coffee growers from across the world and artisan roasted in rural Texas. Naturally Support Your Body's Ability to Grow and Repair Neurons One Cup of Coffee At A Time! Brain Health Through Coffee....Not Pills. One of the quickest ways to improve your health is to optimize something good that you are already doing or what I call - maximizing your winners. 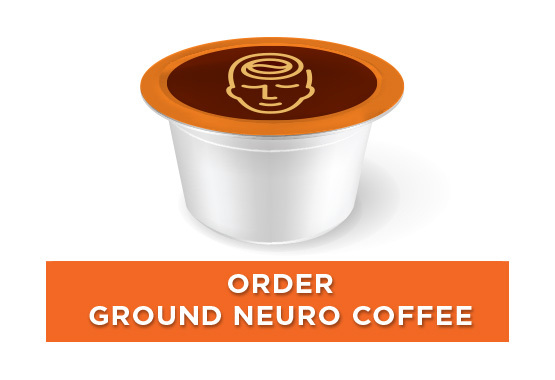 Neuro Coffee is a brain supplement that is delivered via delicious coffee. What does this mean for you? 1. You'll never forget your brain supplement again as when was the last time you forgot to have your morning cup of coffee? 2. By putting a brain supplement inside of your coffee - you get a Powerful Brain Supplement You'll Always Remember to Take. The synergy of coffee and a brain supplement is a breakthrough in nutraceuticals like we haven't seen in years. Why Is Neuro Coffee Unique? Neuro Coffee contains a unique patented blend of antioxidants taken from the coffee fruit - a part of the coffee plant usually discarded at harvest. In two randomized human clinical trials these antioxidants have been shown to support neuron growth and repair by increasing a protein in your body called BDNF. BDNF levels decline as we age. The rigors of modern life (i.e. stress, insufficient sleep, and a inactivity can also lead to lower than optimal levels of BDNF. Neuro Coffee that contains the antioxidants needed to increase this vital protein in the body. 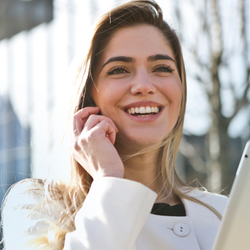 One of the quickest ways to improve your health is to optimize something good that you are already doing or what I call - maximizing your winners. 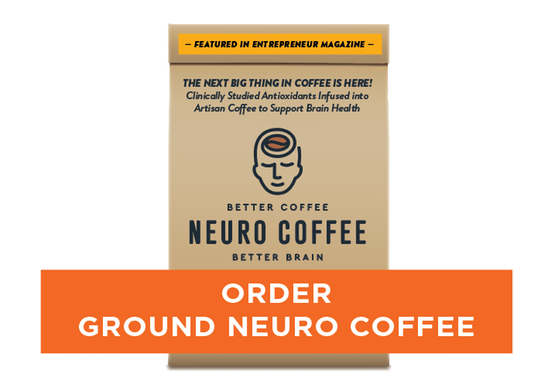 Neuro Coffee is a brain supplement that is delivered via delicious coffee. What does this mean for you? 1. You'll never forget your brain supplement again as when was the last time you forgot to have your morning cup of coffee? 2. By putting a brain supplement inside of your coffee - you get a Powerful Brain Supplement You'll Always Remember to Take. The synergy of coffee and a brain supplement is a breakthrough in nutraceuticals like we haven't seen in years. 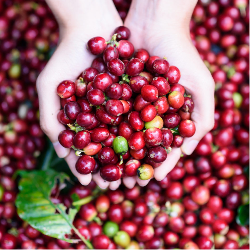 Neuro Coffee contains a unique patented blend of antioxidants taken from the coffee fruit - a part of the coffee plant usually discarded at harvest. In two randomized human clinical trials these antioxidants have been shown to support neuron growth and repair by increasing a protein in your body called BDNF. BDNF levels decline as we age. The rigors of modern life (i.e. stress, insufficient sleep, and a inactivity can also lead to lower than optimal levels of BDNF. Neuro Coffee that contains the antioxidants needed to increase this vital protein in the body. What is BDNF and Why Does it Matter To Our Brains? BDNF or Brain Derived Neurotrophic Factor is a protein produced by our body with the job of helping our body with the maintenance and repair of neurons. 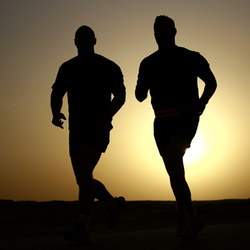 BDNF has been called 'miracle-gro for the brain' by a leading neuropsychiatrist from Harvard. As we get older our brain decreases in volume. Many researches attribute this age related reduction in brain size to be due to decreases in levels of key compounds in the body like BDNF, GDNF, and HSP-70. Aging is associated with lower levels of BDNF. This is why choosing lifestyle habits and activities that increase BDNF is recommended by neuroscientists that study aging. Michael Roussell, PhD, is a nutrition advisor and columnist for Men’s Health and Shape Magazine, and one of the country’s most sought-after nutrition experts. Dr. Mike has written and published over 500 articles on nutrition, health, and wellness while authoring 4 books. 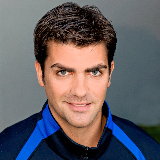 He works with a wide range of clientele including professional athletes, celebrities, and executives seeking to improve mental and physical performance though nutrition. Neuro Coffee Simplifies and Revolutionizes Your Brain Health Support Regimen. Just Drink Coffee! We are so confident that you will LOVE Neuro Coffee that your purchase is backed by TWO unconditional guarantees. 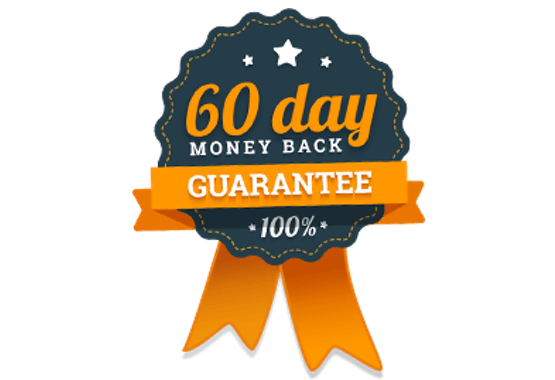 Guarantee #1: 6 Month No Questions Asked Money Back Guarantee - If you aren't happy with Neuro Coffee for any reason (or no reason at all!) we will refund 100% of your purchase including shipping! Neuro Coffee helps you streamline your health by combining a clinically studied brain supplement and delicious coffee for under $1 per day. 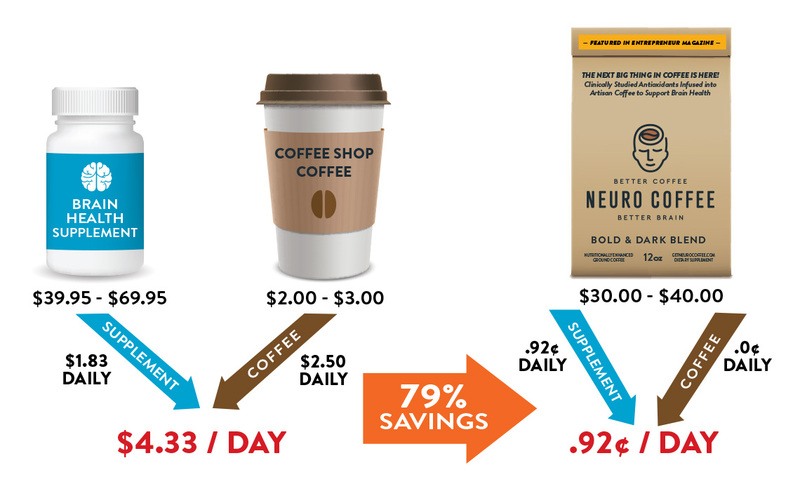 When compared to other brain health supplements and coffee shop coffee you will save 88% each day and your coffee is essentially free. 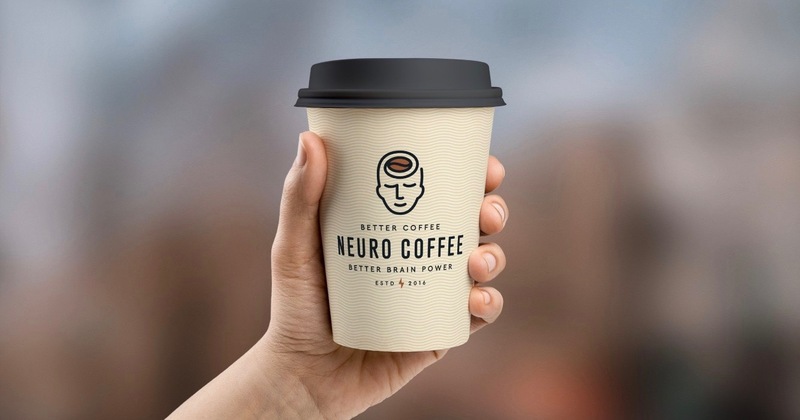 Because Neuro Coffee is delivered via coffee, you'll never have to remember to take any pills or additional supplement each morning - just drink your coffee. 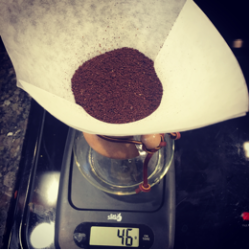 Drip, French Press, or Chemex - You've never had a brain supplement that is so enjoyable to take each and every morning. 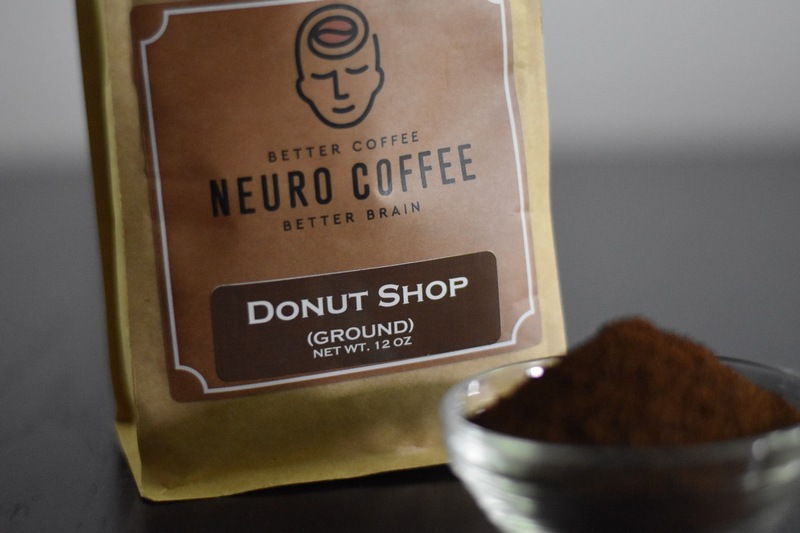 Our freshly roasted and ground Neuro Coffee is perfect for people that like to brew their coffee just how they like it while also being able to support their brain and neuron health regardless of age. 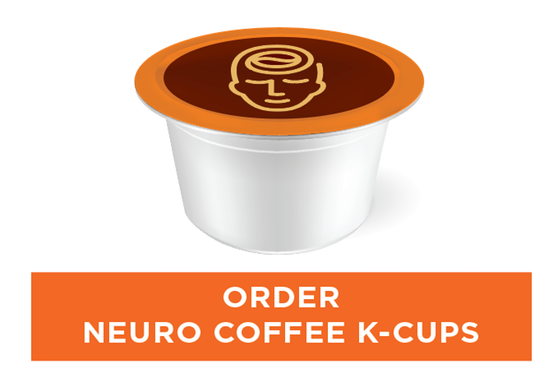 Compatible with all original and 2.0 Keurig coffee brewers the recyclable Neuro Coffee single serve pods make it so simple to support your mental agility and brain health. Each pod is carefully filled to contained the clinically tested amount of whole coffee fruit extract needed to increase BDNF. Eric "can't get enough" Neuro Coffee! "This coffee is excellent. I am a customer service nitpicker and am truly blown away by you guys. The inclusion of the background of the coffee, the stickers, the t-shirt is high quality. 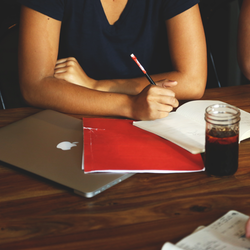 You put forth an excellent product and back it up with top notch customer service. I have been singing the coffee and your praises since I got my first package. Keep up the excellent work." I've been an avid drinker of Neuro Coffee since it came out, and for good reason. Not just because it tastes great, but because of the mental clarity I receive afterwards. Some of my best work has come after I had taken Neuro Coffee, and I consider it an essential piece to staying productive and enhancing my learning. An essential way to start your day! 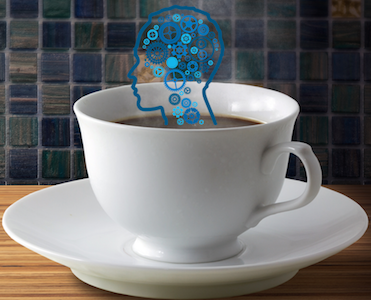 This fresh, tasty brain boosting coffee is really in a class of its own. 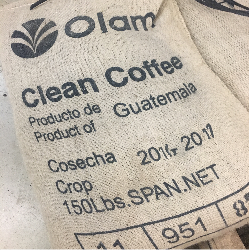 From the delivery to the final drop in that cup this coffee overdelivers excellence. This would be a great gift idea to a loved on or for yourself. Every month the freshest coffee shows up at your door. Why Start Another Day With Regular Coffee When Neuro Coffee Can Also Care for Your Brain?